Welcome to the section of Reusable Art where we share vintage pictures of owls. All of the bird images shown here are copyright free and free to download for scrapbookers, website designers and anyone else working with images. Pictures include simple black and white owl drawings to detailed and realistic renderings of these large and somewhat mysterious birds. If you are searching for other birds of prey drawings, be sure to check out the and birds of prey sections. 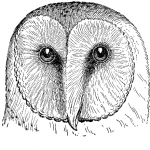 Stunning black and white barn owl drawing featuring the distinctive lightly-colored heart-shaped face and black eyes the species is known for. 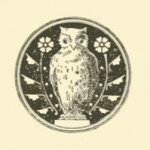 Small owl engraving from 1880. Public domain bird image from 1880 of an owl on a leafy branch and showing off his long black talons. 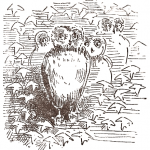 Owls in tree is a vintage drawing that was included in a children’s book from 1881. This engraving includes four owls surrounded by oak tree leaves. 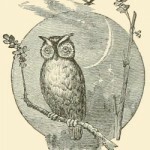 Vintage drawing of an owl in the moonlight. Vintage drawing of an owl and flowers. 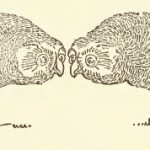 Drawing of a pair of owls. 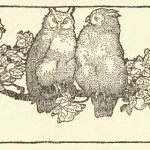 Vintage owl drawing of two owls sitting in a flowering tree. 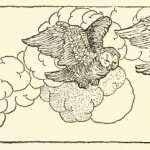 Drawing of owls flying in the clouds. 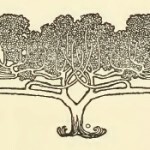 Public domain owl drawing with two owls in the same tree. Whimsical drawing of an owl on skis.